Here is a map showing the respawn locations of each reagent found in The Porrtico. ﻿﻿The following is a video of me going through my route in The Portico. I have found this to be the quickest way through, but others may find a quicker way. Do whatever works for you. I have added commentary detailing which reagents can be found in each area. That was the first video I ever made. And guess what! I now have all the pearls, golden pearls, and black pearls I need to craft the Observatory. I think I have almost all the aether. 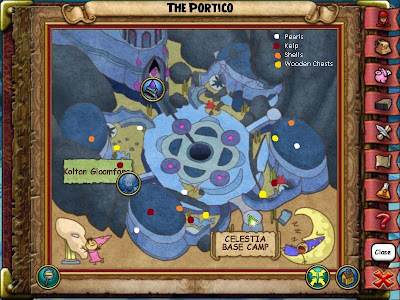 I may need a couple more kelp to transmute the rest. But that's a few things crossed off the list at least.